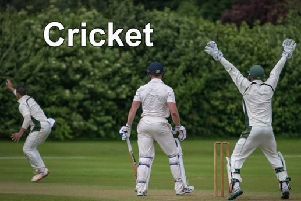 Alford and District First XI suffered a 130-run defeat at Boston in the Lincs ECB Premier on Saturday. The hosts had posted 151 before being dismissed. But in response Alford were all out for 21 with less than 10 overs of their innings played. Rikki Bovey caught and bowled Boston danger man Jonny Cheer at the Mayflower, but by then his 65 runs had done the damage. Bovey took four wickets with Nick Bennett (three), Steve Kirkham, Andrew White and Tom White adding to the tally. But with the bat Alford failed to get going, Andrew White top scoring with nine runs as the 10 men of Alford were soon back in the pavilion. The Seconds’ match at Louth Thirds in the Lincolnshire County League Supplementary Cup was abandoned with Louth on 58-4 in the 17th over. On Saturday the Firsts host Market Deeping (noon), and the Seconds travel to Horncastle (2pm). The following day the Sunday Firsts host Brocklesby Park in league action.